The holiday season is sneaking up on us!!!! I have posted several free patterns on Facebook for our “Would you Wear (use) it… Would you make it? ?” segment featuring Holiday Patterns... This weeks Fan Favorite was a hit! And just in time for making up a few gifts/ornaments for the upcoming season!!!! Very angelic… So here is your Facebook Fan Favorite…. If you want to participate in the upcoming Crochet-A-Long... Cast your vote by December 15th for the Viewers Choice Pattern… We will have a ton of fun and I can’t wait to see how all our projects turn out!!! Click on the Crochet-a-Long tab at the top of the page to cast your vote!!!! With the weather changing here,,, I am working on lots of hat, fingerless gloves, cowls, scarfs, slippers and much more to stay warm… What are you working on??? Those wee angels are so cute! 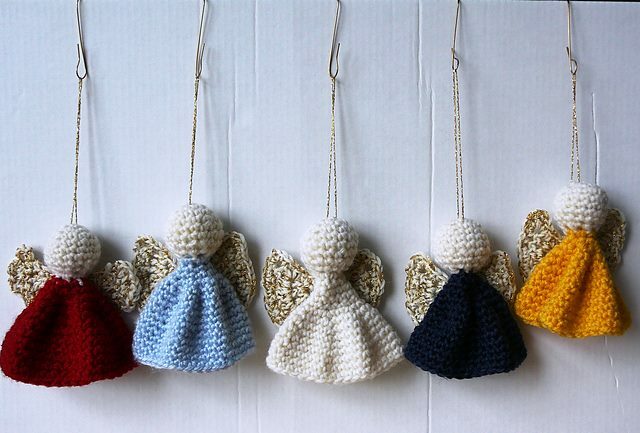 Very Cute… I am definitely going to make some!! Ohh,. Can’t wait to see your CAL! Oh those are great! I think I might make a couple!